← The Greatest Crisis Facing Humankind? Alex Epstein is the founder of the Center for Industrial Progress. In 2014 he published a New York Times Bestseller titled The Moral Case for Fossil Fuels. He is a featured speaker at many colleges and universities, and appears regularly on television and radio talking about his book and his organization. He also hosts a regularly available podcast, The Power Hour, on which he interviews experts from a wide range of social, economic, and scientific disciplines. I found his book enlightening and well worth my time. It is well documented and readable, regardless of your background or expertise. This past April, he testified before the Senate Committee on Environment and Public Works. His interchange with Senator Barbara Boxer is noteworthy, and quite entertaining, if you are not a fan of the California Senator. In a recent podcast he mentioned that he had written a two-page synopsis of his book, and he asked that it be shared widely in the hope that many others could understand its thesis. It is presented below in its entirety, but with some modifications to formatting. Additional information can be found on the Website of the Center for Industrial Progress. At the Center for Industrial Progress, we reject the common standard of minimizing human impact. Our standard of value is: maximizing human flourishing. Thus, when we consider fossil fuels, we do not write them off as bad because they cause some man-made CO2 and some man-made warming. We look carefully at the full context of their potential impacts on human flourishing now and in the future. There are 7 billion people in the world who need cheap, plentiful, reliable energy to flourish. Some 3 billion have virtually no energy by our standards, which means we need vastly more energy. It is extremely difficult to produce cheap, plentiful, reliable energy. In the entire history of humanity, only three industries have achieved this on any scale: the hydrocarbon (fossil fuel) industry, the nuclear industry, and the hydroelectric power industry. The fossil fuel industry produces over 80% of the world’s power because it is the only industry that has figured out how to produce cheap, plentiful, reliable energy for electricity, transportation, and heating on a scale of billions. Since the energy industry is the industry that powers every other industry, the fossil fuel industry increases productivity and prosperity in every area of life, from agriculture (diesel-powered farm equipment) to hospitals (24/7 electricity). The only industries that can meaningfully supplement fossil fuel energy are the nuclear and hydroelectric industries, which are widely opposed by environmentalists. Even without this opposition fossil fuels would still be irreplaceable for decades to come. Hydro is limited by lack of suitable locations. Nuclear has the long-term potential to expand greatly, but is many decades away from scaling to the level of billions. For these reasons, any restriction on fossil fuel use would do devastating damage. This must be factored into all policy debates over restricting fossil fuels to reduce CO2 or other byproducts. The number one environmental concern: climate impacts. To assess the climate-related impacts of fossil fuel use, we have to carefully assess the consequences to human flourishing of 1) the warming impact of CO2, 2) the fertilizing effect of CO2, 3) the protecting effect of affordable energy for all climate danger. The warming impact of CO2 is mild and quite possibly positive–in no way does it justify restricting fossil fuel use whatsoever. It is a proven but little-known fact that the greenhouse effect of CO2 is a diminishing, logarithmic effect; each molecule of CO2 warms less than the last. The belief that increases in CO2 will cause runaway warming are based on speculative climate dynamics represented in models that have utterly failed to predict climate. Global average temperatures and CO2 levels are near all-time lows from a geological perspective; today’s CO2 levels are an estimated 1/20th their all-time high (a highly fertile period). Warming is almost universally desired among civilizations, with cold-related deaths dramatically greater than heat-related deaths. In general, life thrives under warmer conditions. The widely-ignored fertilizing effect of CO2 is significant and positive, yet ignored; a proper energy and environmental discussion must take it into account. Increasing CO2 levels is a proven driver of plant growth, which is why greenhouses contain 3 times as much CO2 as our atmosphere. Satellite data show dramatic increases in plant growth in uninhabited locations as CO2 levels have increased over the past several decades. Increased CO2 has also contributed significantly to crop yields and helped millions avoid malnutrition or starvation. The widely-ignored protecting effect of fossil fuels is spectacularly positive; it has helped us take the inherently dangerous climate and make it far safer than it has ever been. While the climate debate treats the global climate system as naturally stable and safe, it is in fact naturally volatile and vicious. Climate safety requires climate protection through development and technology–both of which are fueled by affordable energy. The international disaster database, which tracks climate-related deaths–including deaths from flood, droughts, extreme heat, extreme cold, storms, and wildfires–shows a 98% decrease in the rate of climate-related deaths since significant CO2 emissions began 80 years ago. Fossil fuel use doesn’t take a safe climate and make it dangerous, it takes a dangerous climate and makes it safe. If we truly look at fossil fuel energy by the standard of human flourishing, we discover that it is not an immoral product we need to restrict but a moral product we need to liberate, just as we need to liberate other persecuted sources of energy such as nuclear power and hydroelectric power. Our society’s lack of a clear, pro-human, full-context framework for thinking about energy is leading to disastrous, anti-fossil-fuel, antinuclear, anti-hydro policy decisions that are already harming millions and will harm billions. A fast, easy way to make an impact is to share this document with your friends, family, coworkers, favorite commentators, and elected officials. Go to IndustrialProgress.com/fossilfuels to get a PDF to share with others. About the author: Alex Epstein, founder of the Center for Industrial Progress, is a humanist philosopher who seeks to identify the full context of industrial and environmental controversies. 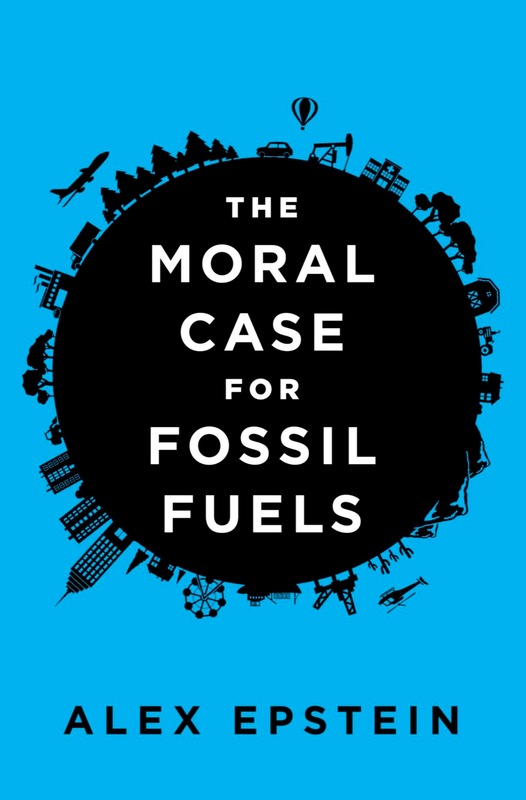 His New York Times bestseller The Moral Case for Fossil Fuels has been widely praised as the most persuasive argument ever made against climate catastrophism, and led The McLaughlin Group to name Epstein the most original thinker of 2014. This entry was posted in Climate Science, Energy, Human Behavior, Politics and tagged Alex Epstein, carbon dioxide, Center for Industrial Progress, Energy, Fossil Fuels, Moral Case for Fossil Fuels, Senator Barbara Boxer. Bookmark the permalink.